As we get farther into fall, I’ve loved being able to mix and match pieces in my wardrobe. Often times, I find myself coming up with outfits I wouldn’t have thought of originally! To change up the usual sweater + scarf + jeans combination (always a classic) try using a swing dress as your base layer. This shearling vest continues to be a favorite of mine, and the colors in this scarf? Amazing. As many of you know, I was in Paris from the Tuesday of last week until yesterday. In the wake of the tragedy that occurred on Friday night, I decided to end my trip early and head home. I’m heartbroken to have cut my adventure in the city of lights short, but infinitely more so over the events of Friday night. That was evil like I have never experienced in such close proximity. I want to take a second to thank each of you who reached out expressing concern and offering thoughts and prayers. Each comment and email added a little extra dose of courage to the confused and overwhelmed heart of this girl, and I read each and every one. It’s still a lot to process. It still hasn’t hit me yet. It honestly feels like it can’t possibly be real, and I am only a tourist. The pain those living in Paris are facing right now is something I can’t begin to imagine. I stand with the rest of the world in praying to a God who stands unshaken, compassionate and in complete control, and find comfort knowing that He wins. Evil doesn’t. Thank you again, friends. I love you so very, very much. Oh my gosh, how cute is this outfit!! 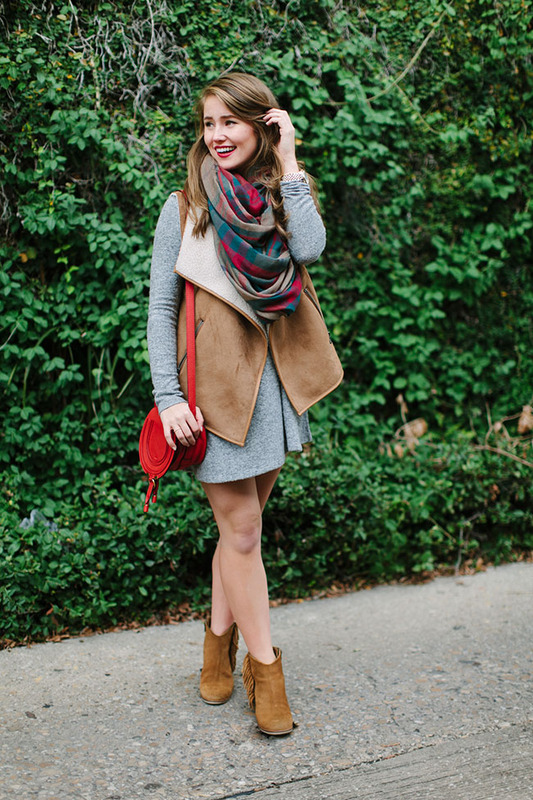 I love the combo of the vest and blanket scarf, especially paired with that fab bag! Such a cute look! Thought of you so often and kept up with you through Susan so happy you’re back and safe! 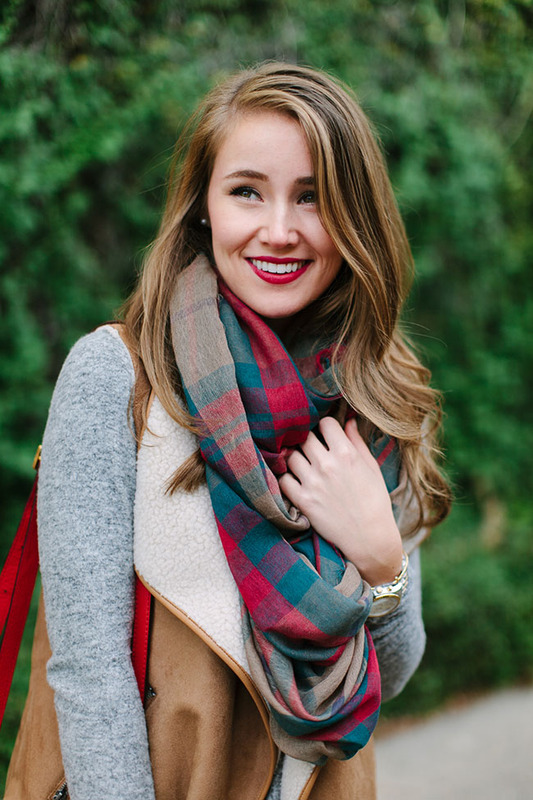 This is SUCH an adorable holiday-inspired look! Glad you’re back home, safe and sound! Loving those layers!! 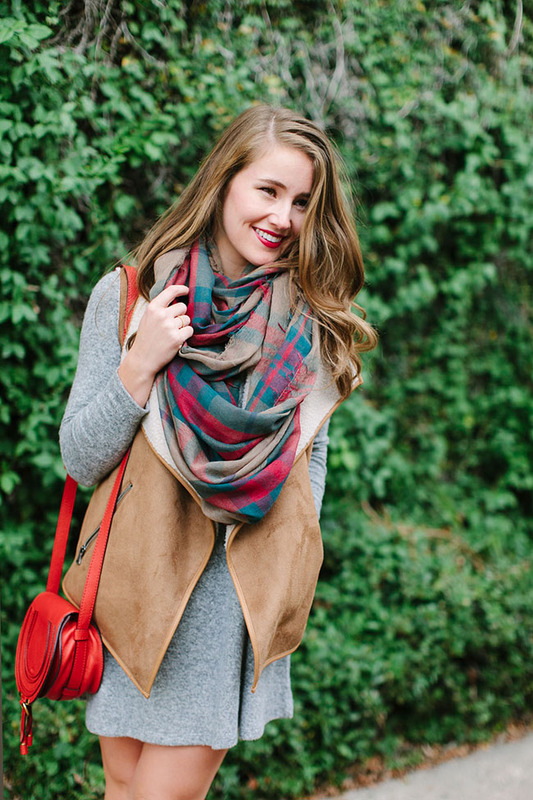 That scarf and vest combo are perfection! You did a great job tying in those pops of red. 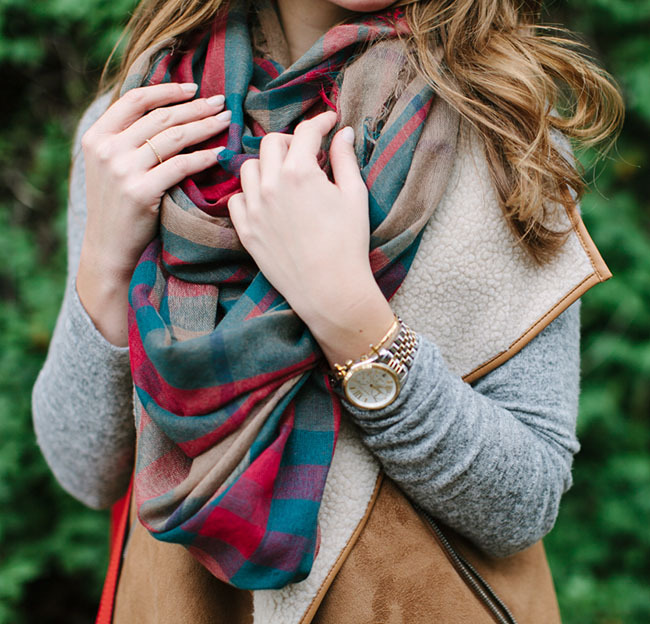 Blanket scarves and shearling… The perfect combo! Love this look, Kate! Love this layered look!! You look beautiful!! Kate, this is an adorable look..cozy but very stylish! You look beautiful and I love your red lip! Thank you for sharing and have a wonderful week ahead! This looks so cozy! I especially love that scarf! You look absolutely stunning girl! What a bright and beautiful smile you have-it really makes me happy :) Happy to hear you are safe! God is so good and evil never comes from Him. Absolutely love the combination of this outfit! And I’m glad you are safe.